making my day!!! I am glad that I could actually make you all smile! things change, at least for me it changed. how my hair would grow long. appreciate her efforts and promised her, never to be fussy about food. something and ensure that I finish everything on my plate. your prayers; she needs your wishes and blessings! What are some of your thoughts about food and do you also enjoy cooking? and curious…so how about sharing some of your thoughts in the comments, now! out a recipe this evening! Do convey my wishes to her as well and the warmth that you spoke about came through your words too dear… I could feel that as I remembered the hugs I got when I met her!! Happy birthday wishes to Vidya. A peek-a-boo in your eating habits of yesterday. You and Privy get good Google pics while i do not get. Is Google partial to you both? Hehehehe Kalpana, Your words are so powerful that pics ki zaroorat hi nahi hoti 🙂 Thanks for your wishes dear! Thanks so much Shilpa:) yes, its just coz of her that I changed my habits! I welled up reading this…sisters have such a special bond don't they! Wishing your sis a very happy birthday! GI and enjoy some lovely eateries! Thanks Sheetal. She indeed is an amazing personality and I adore her very very much! Thanks for your wishes! Wishing your sister a very happy birthday (slightly belated, about half an hour I guess) and I hope you both had a fantastic time celebrating! Thanks so much Leo for your wishes 🙂 Yeah we had a fab time and enjoyed a lot!!!! Thanks to all of you for your wonderful wishes. …. 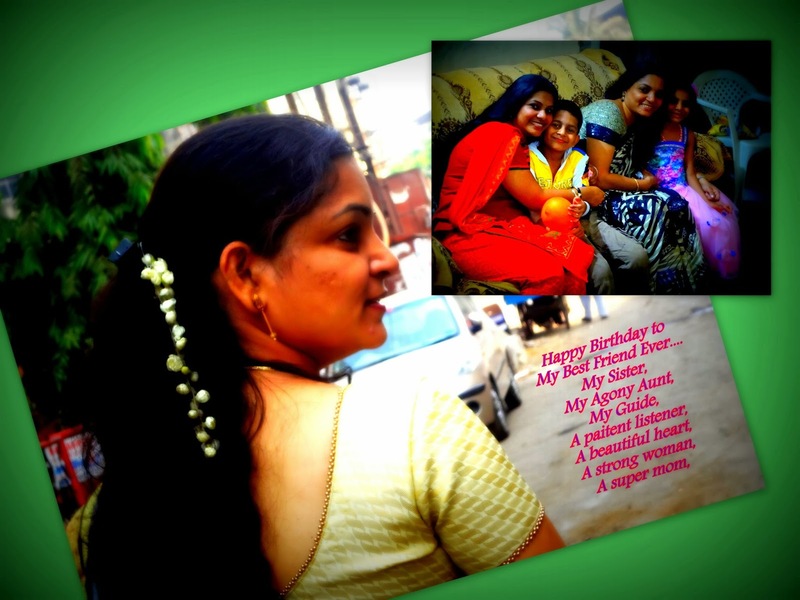 Me always grateful to gayu…. Who writes about me in every blog….. Thank you for making my day dear…. LUV U……. That was so lovely and touching!! A very happy birthday to your sister. What a wonderful sister you have. Thanks for sharing her with us. That was a touching post. And a brilliant take on the prompt!